Prepare to lay your eyes on what could perhaps be the most 80s thing you’ve ever seen. We’ve clambered out of a deep (deep) YouTube hole to present you with “How To Do That” – a (criminally) forgotten 1989 electro-pop track recorded by none other than Jean Paul Gaultier, who this week staged a very 60s-inspired couture show which featured a cameo from model Coco Rocha and her mini-me daughter. 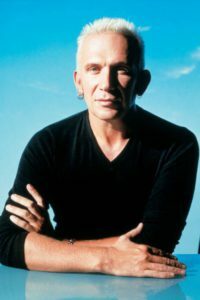 Though Gaultier is well-known as the enfant terrible of French fashion, and as Antoine de Caune’s partner-in-crime on Eurotrash, that he also fancied himself as a pop-star might just be brand new infomation to many. The video for “How To Do That” sees Gaultier sketching away at his desk, waiting for inspiration to strike, as models including a v fresh-faced Naomi Campbell throw some pretty interesting moves – all while wearing classic JPG styles. Breton tops? Button-down military-inspired jackets? Conical bras? Check, check and check. The track was produced by Tony Mansfield, who was behind (slightly more successful – sorry Jean Paul) hits by a-ha and the B-52s, which should give you an idea as to what to expect, and since we first watched it, it’s pretty safe to say we’ve barely been able to get it out of our heads. “Beauty’s where you find it,” Madonna reminds us in Vogue, her 1990 hit single. The video, shot in chic black and white by David Fincher, helped to bring vogueing from Harlem’s ballroom culture to a much wider audience. Featuring a host of trained dancers against an Art Deco backdrop, Madonna’s video for Vogue represented a seminal turning point in pop culture and style. We see Madonna and her dancers move enigmatically to the music in loose, oversized tailored suits. Several shots recall specific fashion photographs by Horst P. Horst, as in the shots of Madonna posing in an intricate satin corset and in a turban. That famous cone bra corset, as designed by Jean Paul Gaultier and already iconic from its features in the video for Express Yourself, makes an appearance, too, cementing Madonna’s grip on the style of the time. View Jean Paul Gaultier’s fashion in this famous music video. Fashion and music have long made comfortable bedfellows. The equation is quite simple: musicians benefit from having a strong look on stage, while designers can increase their cultural cachet by linking themselves with whoever has the coolest sound at the moment. That might sound shallow, but consider the implications of this – music and fashion can fuse together in the format of the music video. While fashion and trends can be ephemeral, changing on a whim and with the seasons, and while even chart-toppers can become one-hit wonders, a well made music video is a vehicle for cultural synthesis. Here’s the bonus track of today, a song about JPG by Fatal Jamz. I wish you a successful Tuesday and come back very soon with the next story.